﻿ Speed sign traffic detection; radar systems which are different. Speed sign traffic detection technology. Speed sign traffic detection devices form the heart of any sid system. Without an accurate, precise measure of vehicle speed & movement it's impossible to create a usable speed sign. Previous models of speed sign systems used the same kind of off-the-shelf traffic detectors used by almost other suppliers of UK speed sign products. As part of a comprehensive complete redesign process traffic detection is something that's been bought in house. 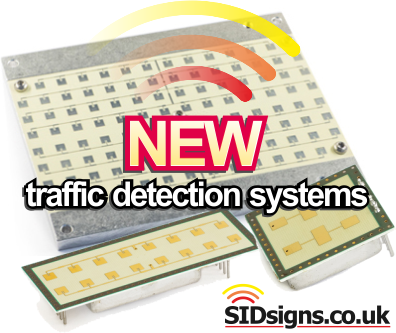 Every new SID system you buy is now fitted with a flexible traffic detection radar system which is assembled from a component level. Designed to be embedded within the sign control software this approach to traffic detection allows us to offer you a more effective service. Buying off the shelf traffic detection radars is fine, you can quite easily build a basic speed sign system around a device like this. Off the shelf is the most popular because it's the easiest option; you don't really need to know what is happening inside. The problem with an off the shelf approach is it limits your expertise; you don't really know how the detection device works, you don't fully understand the signal processing mathematics, you don't have unfettered access to all the settings and software commands. With the most important aspect of radar speed sign manufacturing bought in-house we can now offer you the best traffic detection solution we've ever had. The principles behind these devices, the mechanics of signal processing, the subtle setup changes and software settings; these are all fully understood by our engineering staff. Making your own traffic detection radar system from components which are embedded within the rest of the sign electronics. This is far more challenging task than simply "bolting on" a third party detection device, when you've tried both approaches you quickly see which is the more difficult. So why bother? 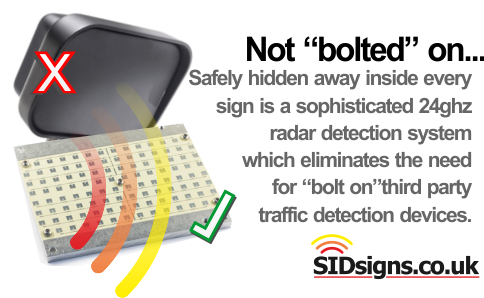 If there is nothing wrong with a "bolt on" traffic detection device why bother with your own system? This is a good question. Using our own traffic detection approach means we understand the system inside and out. If there is a problem we know how to fix it ourselves, we don't have to rely on a third party supplier. If we need to alter settings to suit the demands of a specific site we can do this for you. The most important reason for switching to our own traffic detection systems is one of knowledge; we think we should know as much as possible about the products we manufacture and the technology which sits inside. If we don't fully understand every aspect of radar traffic detection how can we deliver the expert service you expect?